The key interchange on the North Spokane Corridor at U.S. Highway 2 will open Nov. 16, making the existing travel lanes more useful with a new high-speed connection between the two highways. The opening occurs as the northern half of the north-south freeway approaches completion next year. One lane in each direction opened in 2009 from Freya Street near Francis Avenue to Farwell Road, a distance of 3.7 miles. Now, those lanes will be linked directly to U.S. 2 via ramps, including a southbound bridge that is 980 feet long. Plans call for a ribbon-cutting ceremony at 2 p.m. on Nov. 16 on the southbound ramp that connects U.S. 2 to the North Spokane Corridor. 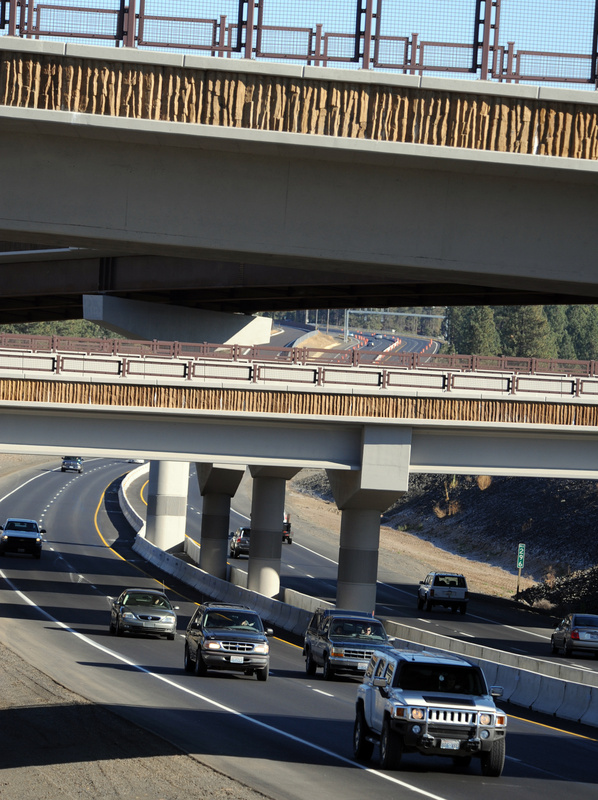 The interchange will open to all traffic later in the afternoon, said Al Gilson, spokesman for the Washington State Department of Transportation in Spokane. Access to the ribbon-cutting will be from the north, he said. The $43 million interchange has taken three years to build and includes lowering the grade of U.S. 2 as well as installation of a 30-foot arched culvert beneath U.S. 2 at Peone Creek. The culvert will allow wildlife to pass underneath the highway. Graham Construction and Management of Spokane was the contractor. “I think a lot more people will use it,” Gilson said of the extended route. Completion of through lanes and an interchange at the existing U.S. Highway 395 at Wandermere should be finished next spring. That will allow free-flowing traffic on 5.5 miles of the eventual 10.5-mile route from Interstate 90 to Wandermere. In addition, a project to build southbound lanes from Farwell Road to the vicinity of Francis Avenue is also under construction and will be completed next year. The segment from Francis to Farwell will have three lanes in each direction, while the main line from Farwell to Wandermere will be two lanes in each direction. A third contract involves construction of an interchange at Parksmith Road, which also is expected to be finished next year. So far, about $600 million has gone into the project. Another $1.3 billion will be needed to build the remaining five miles from Francis to I-90 and build a series of collector lanes through east Spokane. About 6,000 vehicles a day were counted on the existing two-lane segment earlier this year. Engineers expect traffic to increase to about 14,000 to 15,000 vehicles a day once the northern half fully opens. An earlier version of this story incorrectly gave next Wednesday as the opening date of the interchange and the ribbon cutting. It will be Nov. 16.